Prime Minister promises to do 'everything necessary' until rocket fire ceases, after renewed aggression leaves 1 dead. 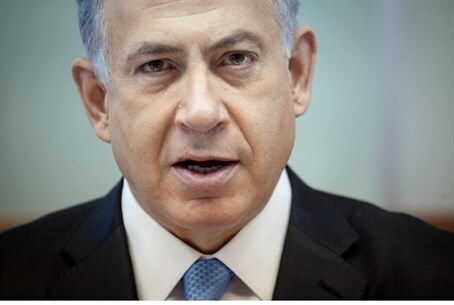 Prime Minister Binyamin Netanyahu addressed the security situation in Israel on Tuesday night, threatening a full ground invasion in the event that escalation from Gaza continues. "If Islamic Jihad and Hamas do not respond to the Egyptian[-mediated] ceasefire, I will tell the IDF to act against them with great force," he said. "And this is what we did: the IDF bombed many terror targets in Gaza, the attacks will continue." "Hamas chose to continue the conflict and it will pay the price for it," he continued. "Anyone who tries to harm the citizens of Israel, Israel will hurt them." "For as long as there is no cease-fire, we will respond with fire [of our own]," Netanyahu added. The Prime Minister vowed to take all necessary measures to protect Israeli civilians. He added that "this campaign has several fronts: the operational front, the political front and the home front. We operate in accordance with our determination, judgment and experience to protect Israeli citizens." "It would be better to resolve it politically but Hamas does not leave us any other choice but to expand and intensify the campaign," he continued. "We will act to restore peace to the citizens of Israel." Netanyahu also implied that the operation, which is finishing up its eighth day, will only intensify. "These are moments when decisions must be made patiently and not recklessly, and I know you trust me to arrive at the decision that would bring peace," he said. "We will do everything necessary to ensure that calm will return to Israeli citizens." Hamas and Islamic Jihad fired more than 100 rockets on Israeli civilians on Tuesday, despite Israel's agreement to adhere to an Egyptian-brokered truce deal early Tuesday morning. Hamas categorically rejected the cease-fire in multiple statements, insisting that the terms of the agreement 'did not apply' to them. The latest volley of rockets left one Israeli dead, a 38 year-old man serving food to soldiers near the Gaza border. The Israeli Air Force responded by launching 30 airstrikes on terrorist targets in Gaza.